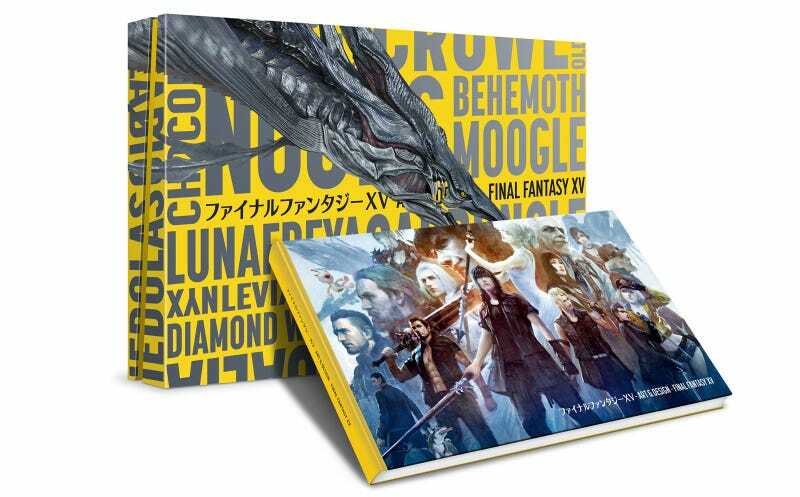 This is The Art And Design Of Final Fantasy XV, a new release from Cook & Becker, a company better known for its expensive art prints (and now $120 Sonic books). It comes in two versions. The regular version ($50) is just a book. The Collector’s Edition ($170) is the monstrosity pictured above, which comes in two enormous cardboard boxes and aside from the book also includes two small versions of C&B’s fancy prints. It’s all incredibly lavish, and for FFXV superfans it might be worth it, but you know, the book is fantastic on its own, so regular folks might just be happy with that. It’s heavy on full-width environment art, pencil sketches and carbon paper chocobos (there are even recipes for the game’s cooking), and I’ve loved going through the whole thing even though I care very little for the game itself. The book is shipping sometime this month, and you can order it from C&B’s website.